Broadcom has made the first significant update to its StrataXGS Trident line of chip-based switches in about two years. The XGS line has been one of the leaders in network virtualization inside data centers, and the new line offers several benefits, including power and cost savings, better programmable support for new software-defined networking technologies, and higher switching throughput and densities. All of these will appeal to large-scale data center customers. The older chips are found in a wide assortment of networking equipment from Hewlett Packard Enterprise, Dell, IBM, and even Cisco. When the earlier Trident line was introduced, networks had several tiers to consolidate traffic. Those days are over, and now we have “fast, fat, and flat” networks to handle higher traffic loads between virtualized servers and hyperconverged racks. The new Trident 3 line will maintain backwards compatibility to existing XGS installations, according to company officials. Switches with this new silicon can be programmed to handle software-defined network virtualization and service chaining protocols, including VXLAN, GPE, NSH, Geneve, MPLS, MPLS over GRE, MPLS over UDP, GUE, Identifier Locator Addressing, and PPPoE, among others. The architecture also supports programmable telemetry, both in and out-of-band packet monitoring. The new switches can scale from 200 Gbps to 3.2 Tbps, and handle networks from 10 to 100 gigabit Ethernet. This means they can be used in a wide range of applications, from smaller LANs to top-of-rack high-density environments. The company claims that they can deliver eight times higher network burst absorption and congestion controls when compared to earlier XGS generations and a three-time improvement in access control list processing. All of the models are based on 16nm chip designs that provide for tremendous power efficiency. 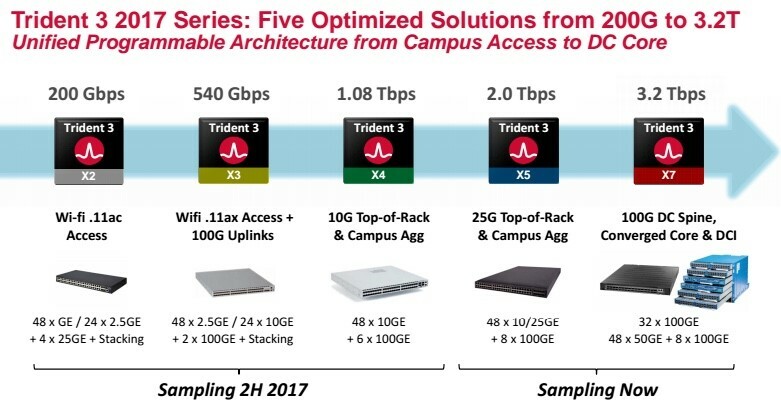 “Trident 3-based platforms will form an important part of Extreme's world class switching portfolio, enabling unprecedented 100GbE economics in the enterprise and end-to-end in-field upgrades of critical new switch functionality," Eric Broockmann, VP and CTO of Extreme Networks, said in a statement. Pricing will be under $3,000 for volume purchases.